The word has been out on fellow CTP Carl Webster’s latest secret project Group Policy Settings Reference for Citrix XenApp and XenDesktop for a couple of weeks now and I really love how he keeps giving all participants the credits they deserve. So let me start by giving a lot of kudos as well to Markus Zehnle, Carl Behrent and Jon Falgout for their help in tracking all those registry settings! When Carl shared the fact that he was starting this new secret project I felt really honored to be one of the “chosen ones” to help his track down all the registry settings that are created on the target machines. And at first it seemed that our job would be an easy one as Citrix has a CTX135039 – Citrix Policy Reference article posted in their Support Knowledge Center. Unfortunately that one is not updated in a very long time (it doesn’t go beyond XenApp 6.5 and XenDesktop 5.6), so I was forced to manually track down the effect of each configured policy setting in the registry of my test machines. What about those ADMX files? And then I thought I had the brilliant idea that ADMX files are nothing more than XML based files these days, so why not build myself a small translating PowerShell Script to turn an ADMX file into a more readable CSV (Reference) file and make those registry settings more visible. And even though it is a great thought that was easily scripted, there is just one minor catch … as Carl pointed out to me … the Citrix Policy Settings in the GPMC or Studio are not based on ADMX files! The only ADMX files that Citrix provides as separate downloads focus on specific client settings, like the Citrix Receiver, Federated Authentication Services, ShareFile, Workspace Environment Manager and Profile Manager settings. Even though it would not make the job easier for the XenDesktop and XenApp policy settings, my own curiosity was triggered to see how easily an ADMX file could be ‘read’ to get the required information. Even though I got the basics figured out after my first runs, it turned out to be a bit more work to translate each element type into the correct format and process the different settings for text, list and select boxes. To explain what the script does, I’ll use a policy setting from the FederatedAuthenticationServices.admx file to dive into the processing of the script. As I’m working on a Citrix Federated Authentication Services design these days I just happened to start my script with the ADMX and ADML files for these policy settings. 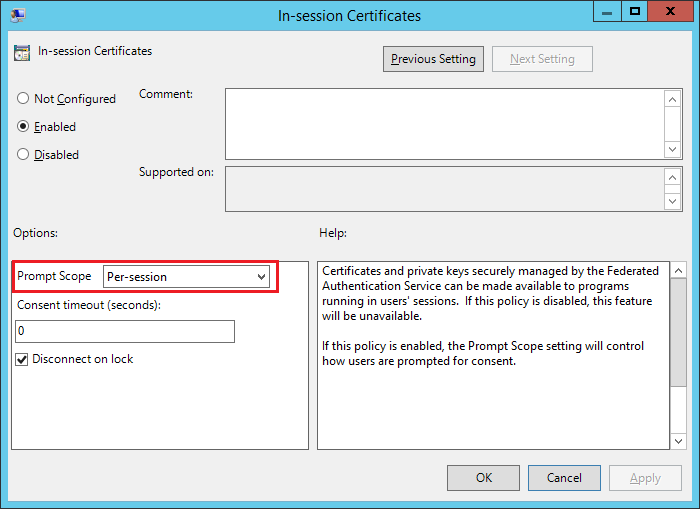 So let’s zoom in on the In-session Certificates policy setting that I can configure. As you can see, the policy can be used to configure three settings on how the smartcard logon certificate that FAS creates can be used within the user session. We can specify the Prompt Scope by choosing an option from a drop down list, enter a value in a textbox for the Consent timeout, and tick a selectbox to have the session disconnect when it is locked. Each policy setting results in one or more registry settings to influence the behavior of the operating system or application. In our example, the policy settings will let the VDA know how to handle the smartcard logon certificate within a user session and whether or not to disconnect when the session is locked. And even though I had a lot of fun tracking down the location of each registry setting by simple enabling the policy setting and checking the registry on the VDA, I knew there had to be an easier way with the ADML file at hand. 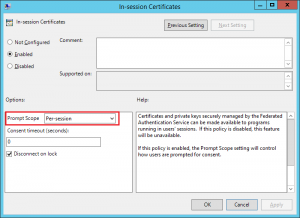 The first line that is highlighted gives us a lot of information about the policy setting as it provides us with the policy name, whether it’s a computer or user setting (or both), and the registry key and value names. So it looks like an easy script to build, right? The part that took the most time in this script is the translation of all the different elements that can be used with the policy settings. Our example already uses a dropdownlist, a text box and a select box to create three registry keys. In order to understand how each element of the policy setting is translated to a registry setting, we need to dive deeper into the ADMX file and check out the structure of the different elements that are listed underneath the policy. If we look at highlighted line 19 of the ADMX file, our first element is an enum element. Erhm, that didn’t make it obvious for me right away. But I got lucky as I discovered that Microsoft has a ADMX syntax page that explains all the different elements and how they are translated by the GPO Editor to registry settings. I don’t think the script has all the elements included in it just yet, but the main settings I encountered are now included and will translate the elements to the right registry values and possible value data. The ADML file is a language file and used to retrieve the actual language specific decriptions for all the labels in the ADMX file, like the displayName for our highlighted policy in the ADMX file. The en-US translation for that is highlighted in line 7 of the ADML file and shows us the name of the policy as “In-session Certificates”. Seems correct if we check the policy setting image :-). And the labels for the different elements can be found under the presentation XML element once you figure out that enum is linked to dropdownList, text is linked to textBox, and boolean is linked to checkBox. Guess keeping them the same in both files would not have made this as much fun as this puzzle became ;-). I had a lot of fun building this script and know I probably missed a couple of policy elements or could even retrieve more information from the ADMX files as it does right now. But this version made my life easy enough to quickly provide Carl Webster the intel he needed for his Group Policy Settings Reference for Citrix XenApp and XenDesktop project. So for now I just leave you with the challenge of sharing your improvements for the script with me on GitHub or in the comments. Feel free to use this PowerShell script (at your own risk 😉 ) to create a reference file to log those policy settings used in Production environments or to add the desired policy settings as an appendix to your technical design documents for easy implementations in future projects. Citrix ADMX Policy information converter. The Citrix ADMX Policy information converter converts the ADMX XML format to a more readable CSV file with policy and registry information. The Folder containing the ADMX files that will be processed by this script. Please include a language subfolder for the corresponding ADML files. The name (and extension) of the output CSV file created by the script. The language (and subfolder name) of the corresponding ADML files to be used by the script. Only en-US has been used during script testing and is included in the selectable languages. Policy information CSV file stored in the root of the provided policy directory. Copyright (c) cognition IT. All rights reserved. # Changing Debugging from default 'Inquire' setting (with prompted actions per Write-Debug line) to continu to generate Debug messages without the prompts. Throw "Policy Directory $ADMXFolder NOT Found. Script Execution STOPPED." Write-Output "* Processing policy $($policy.Name)"
Write-Debug "displayName for $($policy.Name) is ""$polDisplayName"""
Write-Debug "explainText for $($policy.Name) is ""$explainText"""
Write-Debug "registry key for $($policy.Name) is ""$regkey"""
Write-Debug "SupportedOn for $($policy.Name) is ""$supportedOn"""
Write-Debug "parentCategory for $($policy.Name) is ""$parentCategory"""
$valueName = $element.valuePrefix + " (prefix)"
$valueName = $valueName + " (comboBox)"
Write-Debug "elementType is ""$elementType"", value is $valueName"
$policyText = " (policy """ + $policy.presentation.Substring(15).TrimEnd(')') + """, element """  + $element.id + """) "
$elementType="no enabledList items for policy"
Write-Debug "enabledListItem is ""$elementType"", value is $valueName"
$elementType="no disabledList items for policy"
Write-Debug "disabledListItem is ""$elementType"", value is $valueName"
Awesome script and work Esther! certainly not a n00b script :o) – Nice Job! Thanks for the boost of PowerShell confidence Dave! Very nice script Esther! I have found though that the output is not 100% when run against the Citrix Connection Quality Indicator admx files (CitrixCQI.admx). I haven’t had a chance to debug as yet, but the timing of this script was perfect as I need to deploy the Connection Quality Indicator using GPP’s instead of the admx files.